I suppose it would be fantastic to travel around the world to amazing places and write about it, like a travel writer, but I can’t do that. What I can do is get the 43 bus to town (and back again), and, you know, waste not want not and all that. Moreover, I think getting the 43 bus can be pretty good. 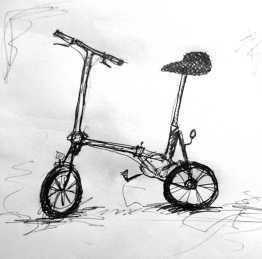 Geoff has some pretty cool drawings on the blog (one of a folding bike is above)and some of them even move. And the soundtrack has got to be a recording of the background sound on board the 43. In his latest post he waxes lyrical about bus graffiti.